Astronomers claim that the Spitzer infrared telescope has found distant black holes hiding behind dust clouds. More likely Spitzer has found the standard signature of electric discharge in space. We hear a lot about the cosmic microwave background radiation (CMBR): Big Bang astronomers proclaim that it proves the Ultimate Truth of the Big Bang theory. But there’s also a cosmic x-ray background radiation (CXBR) that in the Big Bang universe can only come from black holes: No other object can concentrate the weak gravitational force enough to produce the quantity of x-rays observed. The problem has been that there aren’t enough black holes to account for the observed quantity. Now the Spitzer infrared telescope has found a lot of hot dust clouds, and the Big Bang astronomers are seizing on the discovery as proof that many black holes are hiding their optical light behind the dust. Under the astronomers’ theoretical assumptions concerning redshift (the stretching of light toward red on the spectrum), they believe they know the distance to the hot dust clouds. So it’s a simple calculation to determine the energy output required to make the dust appear as hot as Spitzer sees it: Voilà—all the black holes astronomers need (if not more). The trouble is that these black-hole wanna-be’s are identified as quasars. 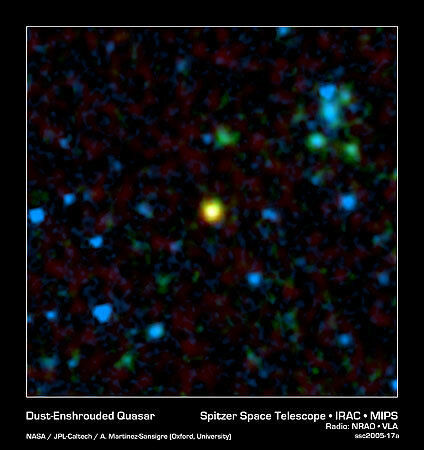 In the image above, blue and green spots represent Spitzer’s observations at two infrared wavelengths, red spots represent radio observations, and the yellow spot represents an object radiating in both infrared and radio—the signature of a quasar. But quasars are observationally and statistically linked to relatively nearby galaxies. 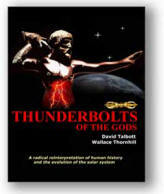 This means that astronomers have been deceived by the quasars’ redshifts. They have assumed that redshift is an indicator of distance, despite the admonition from a growing number of critics that the quasars’ redshifts are largely intrinsic to the objects themselves. If the quasars are not at the farthest reaches of the universe, their energy output is much less than the math indicates, so much less that they can’t be black holes. And the Big Bang again can’t account for the CXBR. Plasma cosmology easily steps over this line in the sand over which the Big Bang stumbles. Electrical double layers associated with active galaxies and quasars generate copious amounts of x-rays, and they do it “the easy way”, by accelerating electrons through an electric field, just like your dentist does. There are no black holes lurking in his x-ray machine. Double layers also emit a lot of microwave and radio radiation. They don’t need to be hot to do it (although they can be). They don’t need to squeeze a lot of matter into the mathematical abstraction of a black hole to do it. They merely radiate some of the electrical energy coursing through the circuit that lights up the parent active galaxy and the next-generation quasar.